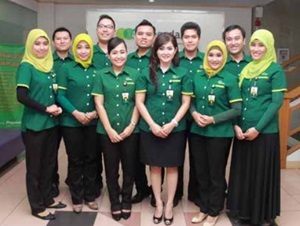 PT Pegadaian (Persero) - Pegadaian is a long standing state-owned financial services company in Indonesia with core business focus on pawning loan services. The history of Pegadaian began in 1746 when Vereenigde Oostindische Compagnie (VOC or The United East India Company) established Van Leening Bank as a financial institution that provides credit with a pawn system. Established the first state-owned Pegadaian in Sukabumi West Java on 1 April 1901. After several times changes of its status, the name of PT Pegadaian (Persero) officially launched in 2012. According to information found in PT Pegadaian (Persero) Annual Report 2016 as cited by JobsCDC.com, Pegadaian succeeded in posting excellent financial performance in the business year of 2016. Pegadaian managed to record a total asset of Rp 46,873.89 billion at the end of 2016. This number equal to an increase of around 19.7% compared to the previous year. Pegadaian's total assets in 2015 amounted to Rp 39,157.96 billion. Referring to its annual report, Pegadaian registered a 8.67% growth in total operating revenue in 2016 value of Rp 9,708.06 billion as compared with Rp 8,933.34 billion in 2015. Total net income for current year 2016 went up by 14.02% from Rp 1,938.43 billion in 2015 to Rp 2,210.25 billion in 2016. Education background in Bachelor Degree (S1) or Master Degree (S2) in any field. Maximum age of 25 years old for S1 and maximum age of 28 years old for S2. Minimum grade point average (GPA) of 3.00 on a scale of 4.00 for S1, a minimum of 3.25 on a scale of 4.00 for S2. Single/not married, and willing not to get married during the education period and period of office bond for 1 (one) year after being appointed as Employee. Have a good health and not color-blind as evidenced by notice letter of health condition from Doctor (optional item and can be proposed at the next selection stage). Valid SKCK (optional item and can be proposed at the next selection stage). JobsCDC.com now available on android device. Download now on Google Play here. Please be aware of recruitment fraud. The entire stage of this selection process is free of charge. PT Pegadaian (Persero) - Management Development Program Pegadaian November 2018 will never ask for fees or upfront payments for any purposes during the recruitment process such as transportation and accommodation.